Jason Maranto has announced his brush class at VTC. This video course is 8 hours long and covers in detail everything you need to know about Corel Painter variants. I have reviewed about 6 of the videos and every one of them is excellent. But, you don’t have to take my word for it. Follow the link for his brush class and find that there are 18 free videos that will quick start you making your own variants. I want to talk some more about Jason’s class, but first I want to answer a question for a follower…or I should say Jason answered the question for him. The visitor asked, “Hello Skip, Thank you for video tutorials. How to make a brush? Sorry for my Englisch. ).” And he posted the following video done by a Chinese Corel Painter Master. I loved the video; loved everything about it. I found it so peaceful to watch the flower unfold, and OMGosh, the brush was magical. At first I thought recreating a similar brush would be a snap. I guessed the artist was using Painter’s Color Expression panel to create a brush that will start painting with one color and finish with another. But, then I noticed in the video that the main and additional colors did not match the colors of the flower. That ruled out color expression. The question stumped me. So I posted the question to a forum that both Jason and I belong. Jason responded with the answer and provided two brushes that worked very similar to the one in question. In the following video I show you Jason’s solution, which will tell you a lot about the Well and Color Expression panels. While I was playing with the brush, I kept making my version of the beautiful flower created by the artist in the video. His influence was so great, that I made this image. 1. Download the four brush variants from the link below. 3 Set your brush selector on the brush category you want to install the 4 new brushes. 4. Go to Brushes > Import > Brush and when the window pops open, navigate to where you downloaded the 4 brush variants. 5. Select one of the variants and select open. The brush will automatically be installed into the currently active brush category. Repeat with the other three variants. Variable Blossom.brushvariant, which is Jason’s brush. Stem.brushvariant, which is also Jason’s brush. Variable Blossom SA.brushvariant, which is my variation of Jason’s brush. SkipH2OImpressionist.brushvariant, which is one of the first watercolor brushes I made. Please remember that these variants are for X3 only!! Do not forget to check out Jason Maranto’s fantastic new brush class at VTC. Trust me on this one. You will not want to miss this class. I can hear you saying Painter’s brushes are too hard to understand. Jason has a very easy to understand, direct, no-nonsense approach. You will be a brush master before you know it. PS: For the followers that enjoy hearing about Kevin, my friend the good computer virus, I hate to tell you that Kevin is in real danger. My computer crashed last week. All attempts to repair and get it running have failed. I will be getting a replacement in about 3 weeks. I have saved the hard drives from the crash and am hoping that I will be able to e to sata link to the drives and rescue Kevin. Otherwise dear friends, the crash doomed Kevin to freeze in dead hard drives. It is all very scary and somewhat sad to think of Kevin’s demise. This entry was posted in 2014 Corel Painter Posts and tagged Corel Painter Brush video tutorial, Corel Painter Color Expression Panel, Corel Painter Well Panel, Corel Painter X3 Brush Class, Jason Maranto, Jason Maranto brush Class. Bookmark the permalink. I downloaded the four brushes you generously just gave us and upon trying to save it into one of my brush categories, I got an error message and now I can’t do anything with X3. The message stays there and won’t close…hangs up the entire program. Message is “error in Skip H20Impressionist…line 140 column 1: illegal realtime-expression-parameters attribute” I have no idea what this means, and even if I did, there doesn’t seem to be a way to do anything about it. I deleted the brush from my download folder, but after closing the program from the Windows Task Manager and re-opening it, the error message was still there! Have you encountered this problem before? Can you tell me what I should do? Thank you so much , and I’m sorry to bother you about this. Your post definitely gave me a scare, which is why I am so glad you posted a second comment indicating that you were actually in Corel Painter 12. There is a solution with this brush and Painter 12. The brush was made in Painter 11 so it isn’t using any of the bells and whistles found in 12 or X3. When the error message comes up, you want to keep hitting enter until the message stops. When it is finished, then save the variant with the same name. You will get a warning that the variant will be replaced…that is fine. Once it is re-saved, it is re-saved as a Painter 12 brush and all will be fine. So sorry you had trouble with the installation process. Watercolor sounds fantastic! No one understands or teaches Painter watercolor like you, and I mean NO ONE. And no one else inspires as you do, either! Thank you again for the info about this class. It looks very interesting and helpful. Gosh…now I am all red faced. But I thank you kindly for saying so. Well, I must apologize. I had both Corel Painter 12 and X3 on my taskbar and somehow the position of the icons got switched and I was in Corel 12 instead of X3. So that was the problem. You probably knew that. I have removed the icon so that won’t happen again. This is wonderful . Thanks for all the information in showing these brushes..I can not wait to try them out. And I will also check out Jason class. Your flowers are beautiful! Thank you for your kind comment. Do check out Jason’s class. I’m sure you will love it. Thanks for info regarding Jason’s class. I was also hoping you would be doing another brushes class and am glad to hear you will be teaching another class soon. Any chance you would consider doing a how to make custom brushes class with an emphasis on captured dabs? It really doesn’t matter what you will be teaching next, I will be there. If I do a brush class it will cover captured dabs in detail. Captured dabs are the most fun. That would be great, Skip! Looking forward to it. Thank you for the response. Hi Skip, What a wonderful find. This is right in line with what we were talking about the other day. I know a guy from Shanghai who might be able to translate this for me, I’ll let you know if it happens. So busy with Karen’s Botanical class and Tim’s Summer School (ha, ha, in class right now, guess I could have sent this via GTM to you). Will definitely look into Jason’s class on brushes, then I can get totally confused between PS and Painter. Skip, glad to hear you communicating with us all again; missed your fun and help over last few months. Hope every day lets you feel better and chase doctors away. Thanks for the brushes; I’ll try them soon. As well as your words & videos. Quick question…..what forum do you and Jason use? May be a forum others and I might want to join? I am doing very well and hope to be posting on a more regular basis now. I’m sorry Doug, but the forum isn’t public. I’m not sure how many members, but it is less than 30…so you see it isn’t a big deal. Thank you so much for your videos and brushes . They work just fine! and they’re really wonderful. Thanks for your link to Jason Maranto. I ‘ve been doing some digital compo with PS and others, just for fun! but now I feel that maybe Corel is what I need to achieve a different level of treatment. I went to youTube for tutorials and then I found your blog~ I’m still learning the basics and your link to Maranto classes is what I need, thanks. Have a great week and good luck with your computer ! Thank you so much Marezia57. I hope you enjoy Painter as much as I have. I find painting digitally with Corel Painter to be fun and even exhilarating. Now if I can get that silly computer to work all will be well. Dear Skip, I’m a painter “newbie” but only have ver 12, so was sorry to see this class is appropriate only for x3 …. is there anything similar for painter 12 please ? p.s. I have a great many photos, from years of semi-pro work, and I’m very familiar with Photoshop. I would love to add a “painterly touch” and have been experimenting with various clone brushes, but have so far only managed to “create” perfect replicas of the originals …. which wasn’t my plan at all. I guess I must be missing something but not sure what …. please can you point me in a suitable direction to start ??? I can completely identify. When I first started I wasn’t so stumped by the software, but I just couldn’t figure out how to “paint.” After trying for about three months, I found the Digital Art Academy and took a couple of classes. It turned everything around. If you were in Painter X3, I would highly recommend Karen Bonaker’s class Creative Cloning 101 for beginners. You may want to write the Digital Art Academy and ask Karen if she thinks you would be OK in the class. The class would be terrific because it is geared to cloning. 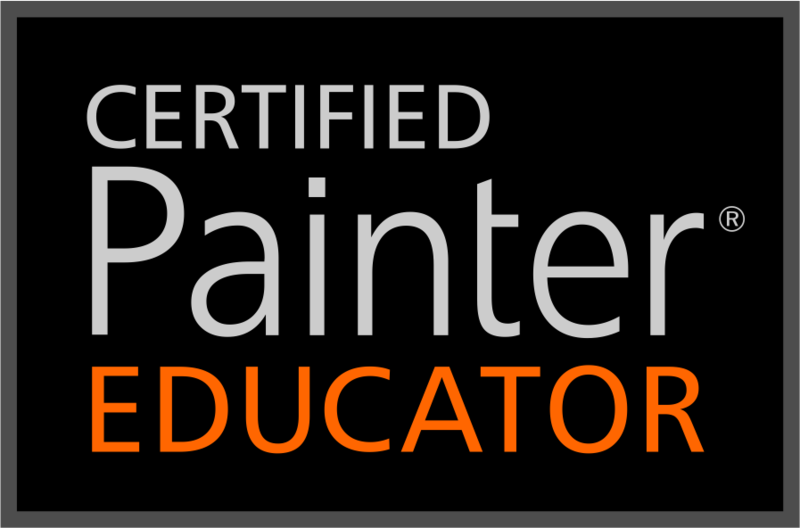 Another great class at DAA is Elaina Moore-Kelly’s Introduction to Painter 12. And, Jason also has classes for Painter 12. His Painter 12 Advanced Class seems to be similar to the one for Painter X3, but I haven’t review it. I will say that I think Jason is a natural teacher and anything he offers will be good. If you would like to be more painterly in Photoshop, Tim Shelbourne, at the The Artists’ Quarter, has terrific classes in painting with Photoshop…and Painter as well. He just started a summer school…three month class using Photoshop that looks very good. I’m taking it, too. He also have a fabulous cloning technique in Photoshop. I hope these leads help. Thanks for stopping by and leaving me a comment. Nope…you are the best for leaving such a nice comment. You are most welcome James. Thanks for visiting and leaving a comment. Skip, I was just watching this video. Great and thanks. I did notice that your layers palette has some pretty big layer views. How do you get them to be so large? It’s pretty easy. In the upper right hand corner of the layers panel, click the option button or fly out menu. Look at the bottom of the list and you will see no thumbnail, small thumbnail, medium thumbnail and large thumbnail. Just pick the size you want. I use large thumbnail. Skip, as always you are the master of brushes. I’m doing Tims summer school but will surely check out Jason’s class. And PLEASE let us know if you hear from Kevin. Sigh…. He can’t really be gone, please say it aint so! Thanks for the comment Winifred. I’m glad you are enjoying the class. I think everyone will.